Portland guard Damian Lillard dribbled past the Jazz’s Thabo Sefolosha, lofting a shot that Rudy Gobert blocked to send the game into overtime last week as the Trail Blazers eventually lost. The next night, in a similar moment, Lillard stopped and hit a winning 3-pointer against the Los Angeles Lakers. And then Sunday, he drove into traffic and scored a clinching layup in the last 29 seconds vs. Oklahoma City. Lillard’s closing effort completed a four-game stretch when he scored between 32 and 36 points, while driving home this discovery: A player who never quite got Weber State into the NCAA Tournament will become the best NBA performer the state’s college basketball programs have ever produced. This discussion stemmed from a seven-day period when Jazz hosted Lillard and three former University of Utah teammates, Kyle Kuzma of the Lakers and Delon Wright and Jakob Poeltl of Toronto. Kuzma is too young to make my all-time top 10, although he’s on his way to potentially the best debut season for an in-state product other than Lillard, the NBA’s unanimous Rookie of the Year in 2012-13. Lillard already has done enough in five-plus pro seasons to elevate him over the Utes’ Andre Miller among the guards on my list, although I’ll make him merely No. 2 overall. So who’s No. 1 right now? Ex-Ute forward Tom Chambers, a 20,000-point scorer in his NBA career — a distinction that fewer than 50 players can claim. Chambers was a phenomenal offensive player in his prime, largely responsible for reviving Phoenix’s franchise in the late 1980s and early ’90s. In his first two seasons with the Suns as a prized free agent (the Jazz really wanted him) from Seattle, Chambers averaged 26.5 points. He led Phoenix to the Western Conference finals each year, after the Suns had won 28 games in the season before he arrived. 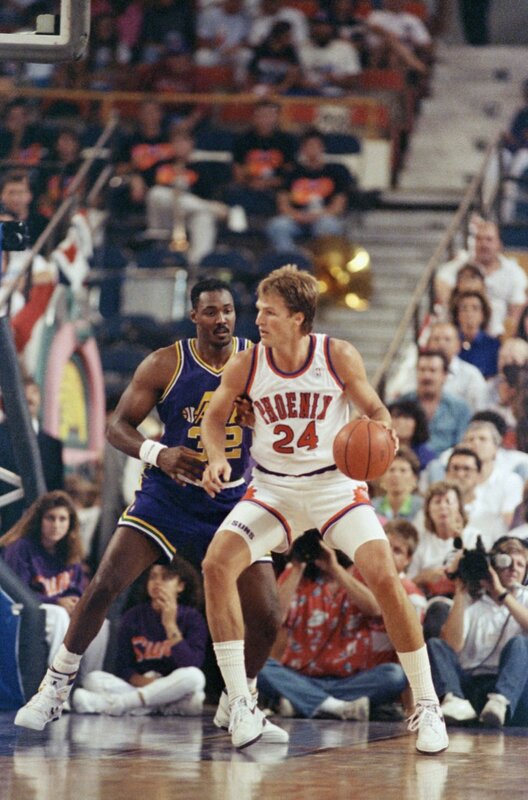 In 1990, the fifth year of the Jazz’s Stockton/Malone era, the Suns won the deciding game of a best-of-five, first-round series at the old Salt Palace. Chambers was a four-time All-Star and a consistent scorer for a long, long time. So maybe Rahe didn’t see “Dame D.O.L.L.A” coming, exactly. Yet it is clear that Lillard’s rap pursuits, his $23.4 million salary this season and his reported $100 million Adidas shoe deal haven’t changed him as a highly motivated player and a grounded person. 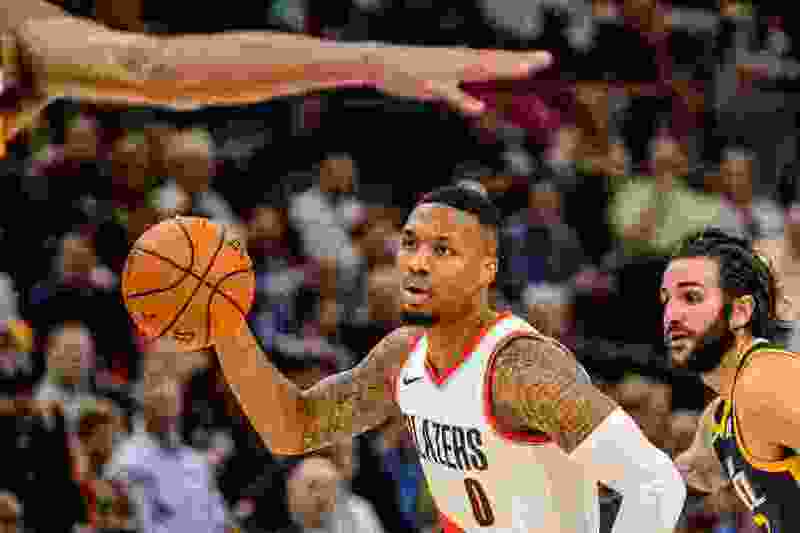 In Portland’s recent wins over the Lakers and Thunder, Lillard displayed the mentality of wanting the ball in the biggest moments and being willing to fail, as he did against the Jazz, and then coming back and succeeding. He’s also loyal to Weber State, having earned a degree from the school after leaving with a year’s eligibility remaining. Both his jersey (No. 0) and the title of his rap album (“The Letter O”) are tributes to Ogden, Oregon and his hometown of Oakland, Calif.
Lillard’s scoring ability and his status as the face of the Blazers’ franchise made me rank him above Miller, even after Miller played 17 seasons in the NBA and is No. 9 on the career assists list. Miller’s consistency and longevity made him a candidate for No. 1 in some people mind’s, but my biggest qualifier is Miller won a playoff series only in his 15thyear in the league, as a Washington reserve. Even if that’s not all his fault, it has to be a factor in judging his career. I still placed Miller above BYU’s Danny Ainge, who played in six NBA Finals with three teams and won two championships. The performances of Ainge’s teams (including Portland) and his success as a Boston Celtics executive make him a unique figure in the state’s history, but he had a lot of help. The Blazers are a long way from NBA championship contention, but this much is certain: Wherever that franchise goes, Lillard will be driving it. 1. Tom Chambers, Utah • 18.1-point average in 1,107 games and NBA’s No. 42 all-time scorer with 20,049 points; 1987 All-Star Game MVP. 2. Damian Lillard, Weber State • 22.5-point average in 406 games; voted unanimous rookie of the year in 2013-13. 3. Andre Miller, Utah • No. 9 all-time among NBA assists leaders (8,524); scored 12.4 points in 1,304 games. 4. Danny Ainge, BYU • Scored 11.4 points in 1,042 games; made an NBA All-Star team and played in six NBA Finals (winning two championships) with Boston, Portland and Phoenix. 5. Keith Van Horn, Utah • 16.0-point average in 575 games; helped New Jersey reach the 2002 NBA Finals. 6. Andrew Bogut, Utah • 10.0-point, 8.9-rebound averages in 677 games, while limited by injuries; won a 2015 NBA championship with Golden State. 7. Mel Hutchins, BYU • Averaged 11.1 points in 437 games in a low-scoring era of the 1950s; four-time All-Star; played in consecutive NBA Finals with Fort Wayne. 8. Mike Newlin, Utah • 14.9-point average in 837 games; shot 50.7 percent from the field in 1975-76. 9. Shawn Bradley, BYU • Averaged 8.1 points, 6.3 rebounds and 2.5 blocks (ranking No. 9 all-time) in 832 games. 10. Nate Williams, Utah State • 12.0-point average in 642 games, including a stint with the New Orleans Jazz.